A couple years back I was going through my things and I found a 30-year-old journal. I started reading, and after a while, I realized how good my life is now. I have it good compared to my teen years. I didn’t have a bad teenage life but it was rather plain and boring during the time I was writing in my journal. 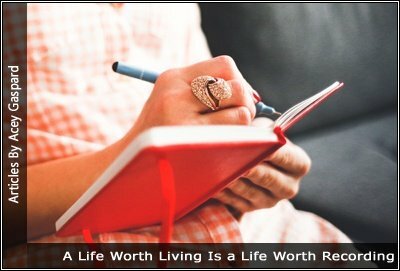 This experience allowed me to see all the good things I have in my life now, but the journal itself was boring. I regret not capturing the good things in my life back then. If I had done that then, I could relive all the good things that happened in my life now through my journal. If I had the chance I would do things differently. Rather than write each day, I would only write about significant issues that took place in my life. I would also write about the lessons I had learned from my life those experiences that taught me what I know today. Think back to all the good times in your life â€“ the best experiences. You can’t, can you? Sure, you can remember a few, but you have to take time to reflect. When you have a journal you can capture all those moments. More importantly, you can relive them and get the satisfaction all over again. It’s like when you watch a movie for the second or third time: you already know what’s going to happen and you watch it again to experience that enjoyment again. What to Capture in Your Journal? I would want to write about the experience and especially how I felt during the experience. You may remember what happened, but will you remember the emotions if you don’t write them down? You will remember the life you lived. You can see past successes and experiences and decide on what’s next for you. You can relive the memories. You’ll enjoy experiences more as youâ€™re having them because you will also be writing about them.